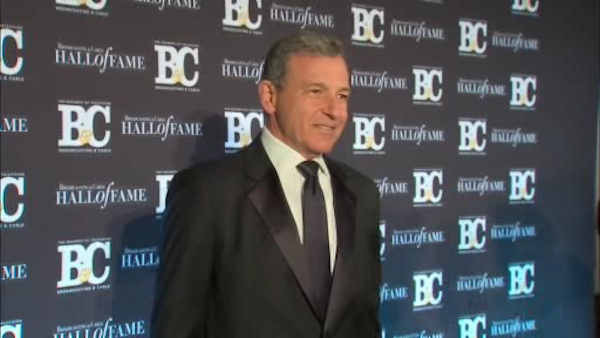 NEW YORK (WABC) -- Bob Iger, the chairman and CEO of the Walt Disney Company, WABC's parent company, received a major honor Tuesday night. Iger was one of 12 broadcast industry leaders recognized at the Broadcasting and Cable Hall of Fame Awards at the Waldorf-Astoria. Regis Philbin and ABC World News Tonight anchor David Muir were co-hosts of the event. As Chairman and CEO, Iger is the steward of the world's largest media company and some of the most respected and beloved brands around the globe. His strategic vision for The Walt Disney Company focuses on three fundamental pillars: generating the best creative content possible; fostering innovation and utilizing the latest technology; and expanding into new markets around the world. Iger has built on Disney's rich history of unforgettable storytelling with the acquisition of Pixar (2006), Marvel (2009), and Lucasfilm (2012), three of the entertainment industry's greatest storytelling companies. Iger has made Disney an industry leader through its creative content offerings across new and multiple platforms. Prior to his current role, Iger served as President and Chief Executive Officer beginning October 2005 and President and Chief Operating Officer from 2000-2005.